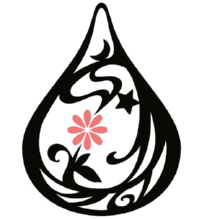 Rock band Kuroyume (黒夢, lit. Black Dream)is making their comeback on February 9 with the release of a new single, “Misery“. Kuroyume is a Japanese rock group that formed in Nagoya during May 1991, initially consisting of lead singer and founding member Kiyoharu, guitarist Shin and bassist Hitoki. They began as a visual kei group, and carried these roots throughout their career with continued emphasis on appearance and packaging. The band had an extensive influence on the visual kei scene, being credited as inspirations by many of the bands of the late ’90’s visual kei boom. The group was officially disbanded by the final live on January 29, 2009. Following the band’s departure from existence, Kiyoharu formed SADS in 1999 and had gone solo by 2003. In 2010, Kiyoharu announced the reformation of Kuroyume and have begun recording for a new album. 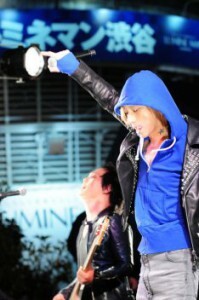 To hype things up, the band decided to do a “secret live” in front of the East exit of Shinjuku Station on January 29. 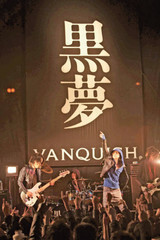 The live was called, “Kuroyume 1/29 X-DAY Supported by VANQUISH“. Five thousand fans gathered in front of the stage as support members KIYOSHI (G), K-A-Z (G) from Sads, and GO (Dr) from Sads appeared on stage. The last to enter on stage was original members Hitoki (B) and Kiyoharu (Vo), and the fans voices grew louder. The first song they played was “Shounen“, and as soon as Kiyoharu started singing, all of Shinjuku was in an uproar. It only took two minutes for police to come and stop the show. Because the music was too loud, staffers informed Kiyoharu, and as each member left the stage, he said one word to their fans, “Sorry“. The staff announced to the audience that the police had requested the live be cancelled, but even though the band left the stage, fans chanted, “Encore“.